Cutlery & Candlesticks and remaining crockery hired. Velvet – I jump from loving it to hating it. What always amazes me is the richness this fabric can create when it is used as a background in a shoot. Christmas is a funny time for stylists as we have usually lived through the decorating process 3-4 months before. I’m not one to use lots of baubles and bows in my decorating so when I was thinking about this shoot I wanted to create Christmas my way, with just a hint, without all the predictable embellishments. Breakfast on Christmas day is usually overlooked or at best very simple, usually involving champagne, and eaten standing up in the kitchen as the focus of most families is to prepare and celebrate lunch or dinner. Mine is a simple breakfast layout but the amazing bright red Christmas bush and the elegant vintage star makes it festive. The table, still set from dinner the night before, is transformed by these additions and your own choice of breakfast fare. Casual is always so appealing. Mood can be created by many contributing elements. As someone that has such an affiliation with the visual I often feel that the setting is of most importance. From the minute you walk in the door that setting or room has an effect on your mood whether you notice it or not. That is why I believe in creating spaces that make people feel good. Colour plays a big part in this adventure and having never been given the opportunity to shoot a blue story and always hoping the brief would pop into my inbox I felt it was the darker blues that resonated with me. Perhaps that’s from my UK background and the love I felt for the winter hues. Would you live like this in sunny Sydney? I’m not sure, but sometimes I wish I had the courage to take a wander into this space for a day or two. Alison Fraser from Slab + Slub is incredibly talented and someone I respect highly. 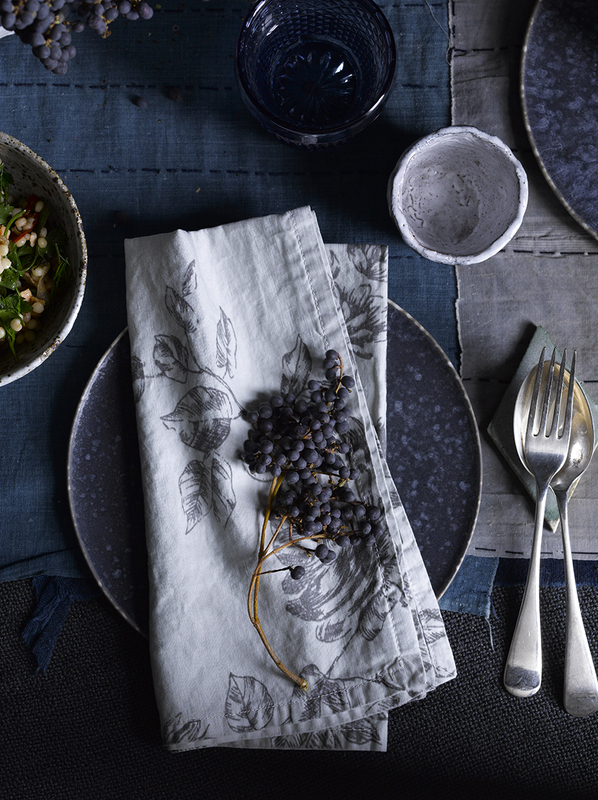 Her handmade stoneware asymmetrical bucket vase and the midnight blue dinner plates by Christopher Plumridge from Planet add earthy texture to the table. 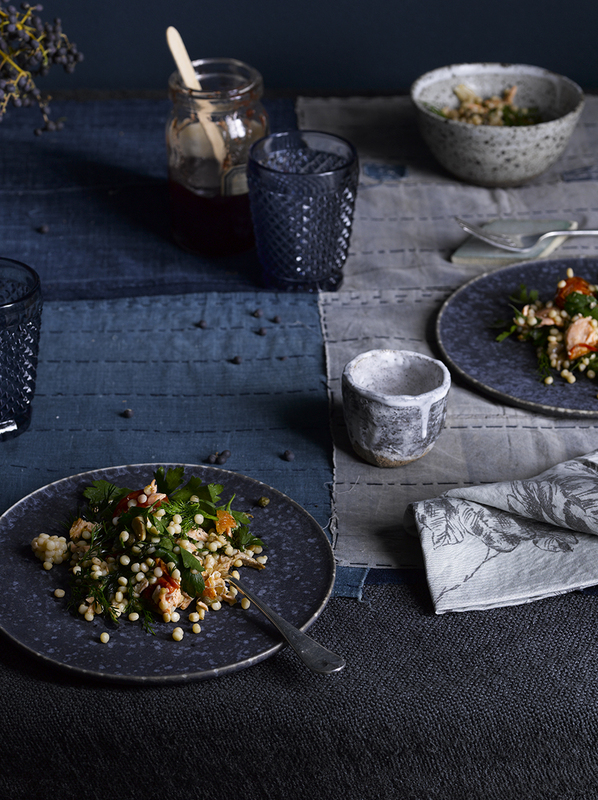 The richness of the palette of the plates works as a stunning background to make the food stand out. You don’t want to look like you’ve gone to too much trouble or you’ll never be invited back. Clever ideas that are simple like this handwritten menu (contact Glenda at writtenbyhand if you would like something customized) on some white cardboard and pinned or blue tacked to the wall or in this case a leftover timber panel is simple but elegant. 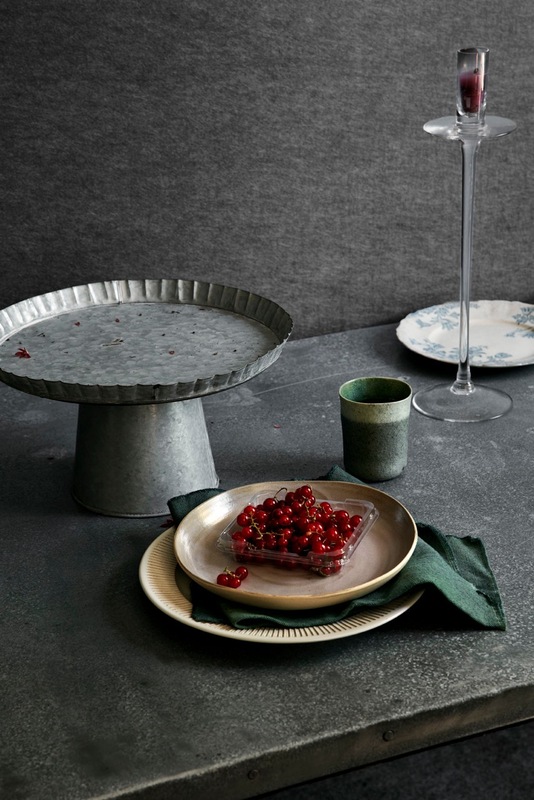 A touch of floral from the Society napkins from Ondeneand the stitched table runner add detail and create layers to the somewhat stark solid colours. If you are feeling like a hands on project Jo Neville from Paper Couture holds classes for these magnificent Pajaki pendant lampshades. Pajaki – it is a Polish paper chandelier that was made to embrace the Harvest and brighten up the home after a long grey winter. They were made with straw and lots of coloured paper often using recycled giftwrap. Jo holds classes at her Paper Couture workshop. Go along, you never know what you’ll fall in love with. What is it that captivates me about a styled white shot? White on white but layered with texture. Is it the light? Is it the focus point? Perhaps it has something to do with the romance of the shots. Or is it the simplicity and purity that white portrays? Today I was lucky enough to be invited by Ross Longmuir to shoot in the beautiful studio in the front area of his Surry Hills concept store Planet. Ross has always been one of my most respected furniture designers and I love his use of sustainably grown spotted gum. His incredible eye and support of local artisans has always put him at the forefront of the interior retail world. His balance of textures, interest in Indian textiles and organic forms marries so well with my styling. When I was style editor for Inside Out magazine. Planet was always a port of call on my sourcing days. I wanted to work with Ross’s wonderful whites and bring in some other talented ceramicists to complement items like Kris Coad, LH Objects and Kim Wallace Ceramics. Over the years I’ve had the pleasure of working with the lovely photographer Sam McAdam whose passion and experience has made these shots come to life. It’s always a treat working with people that understand the outcome and are on the same page visually. Thank you Sam. Lara Hutton from LH Objects has been a mentor since the start of my career and has always felt like another sister to me. I have her to thank for supporting me in the early days and having faith in my ability as a stylist. 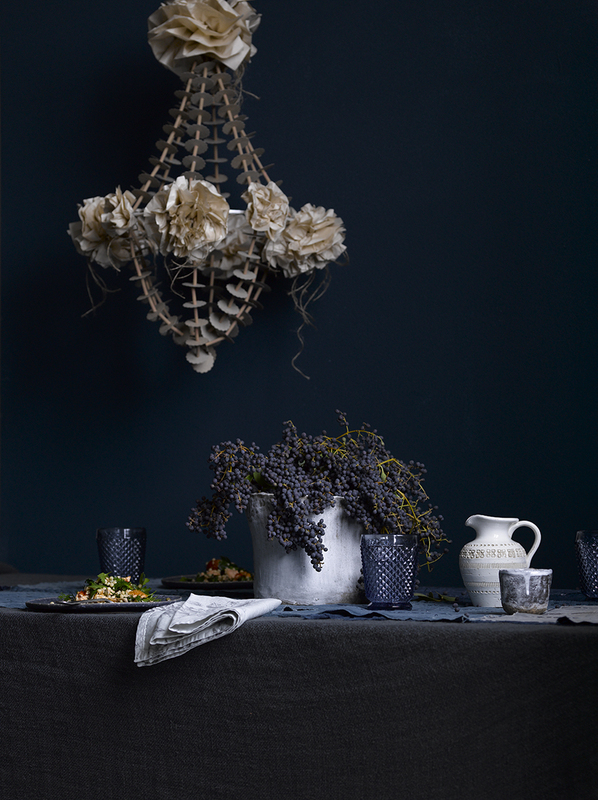 Combining the irregular forms of the ceramics with the crisp white linens that are crinkled rather than starched combined with the elements of nature, the twig in the vase and leaf ceramic by Shannon Garson add the sense of real to the image giving it some depth and life.